MILWAUKEE -- A Milwaukee jury on Wednesday acquitted a former police officer in the on-duty shooting of a black man last year that ignited riots on the city's north side. Jurors found that Dominique Heaggan-Brown, who is also black, was not guilty of first-degree reckless homicide when he shot 23-year-old Sylville Smith after a brief foot chase following a traffic stop Aug. 13. Smith had a gun when he ran, but the case hinged on whether he was a threat when Heaggan-Brown fired the shot that killed him. Body-camera video showed Heaggan-Brown shooting Smith once in the arm as he appeared to be throwing the gun over a fence. The video showed the second shot - 1.69 seconds later - hit Smith in the chest as he lay on the ground. Prosecutors argued Smith was defenseless at the time of the second shot because he had thrown the gun over the fence. Defense attorneys argued Heaggan-Brown had to act quickly to defend himself. Smith's family members reacted angrily to the verdict, swearing and storming from the courtroom. Outside, one man shouted obscenities at a sheriff's deputy as he was held back by other family members. Later, his father, Patrick Smith, said the killing was "in cold blood," but urged people not to react violently to the verdict. "I really don't want them to act irrationally toward the cops, because all cops ain't bad," he said. No protests were immediately evident. Mayor Tom Barrett said police would have a strong presence in the Sherman Park neighborhood hit by the previous unrest, and urged any demonstrations be peaceful. Smith's family filed a civil lawsuit against Heaggan-Brown and the city, family attorney David Owens announced after the verdict. He said it had become clear since the shooting that Heaggan-Brown never should have been on the force. Heaggan-Brown's attorney, Jonathan Smith, said the former officer was thankful for the acquittal and believed he was justified in using deadly force. "There is not joy in a case like this. I think we must be mindful that a young man lost his life," said Steven Kohn, another of Heaggan-Brown's attorneys. Milwaukee County District Attorney John Chisholm, who made the decision to charge Heaggan-Brown, said he did not agree with the verdict but would respect it. Heaggan-Brown was fired from the police force in October after being charged with sexual assault in an unrelated case. The sexual assault case was not mentioned during the trial because it is being handled separately and knowledge of it could prejudice the jury. Smith's shooting was among a string of killings of blacks by police in recent years that have increased debate about race and policing. Heaggan-Brown's acquittal came less than a week after a Minnesota officer, Jeronimo Yanez, was acquitted in the shooting death of a black motorist seconds after the motorist informed him he had a gun. Yanez testified the driver, Philando Castile, disregarded his commands not to take out his gun and he feared for his life. In Milwaukee, Smith's death brought to the surface long-simmering tensions between black residents and police, and demonstrators assembled near the site of the shooting in Sherman Park hours after it happened. Two nights of riots followed, with protesters throwing rocks, bricks, and bottles at police officers. The protesters burned eight businesses and a police car and when it was over, 40 demonstrators had been arrested and a handful of officers hurt. In the encounter with Smith, Heaggan-Brown and two other officers had approached Smith's rental car because it was parked more than a foot from the curb and they believed a drug deal was about to take place. In Heaggan-Brown's bodycam video, he began chasing Smith immediately after stepping out of his patrol car. Heaggan-Brown's camera shows him briefly pointing the gun at Smith as he begins the pursuit. He put his gun back in his holster as Smith turned into a path between two houses. Smith slipped and fell near a fence, dropping his gun. He started reaching for it as he stood up, with his left hand holding the fence. When the video is slowed frame-by-frame, Smith is seen holding the gun by the barrel to throw it over the fence. Prosecutors argued that Smith no longer posed a threat. The two shots by Heaggan-Brown came in quick succession, striking Smith once in his right arm and then the fatal shot to the chest. The 12-member jury included four African-Americans. 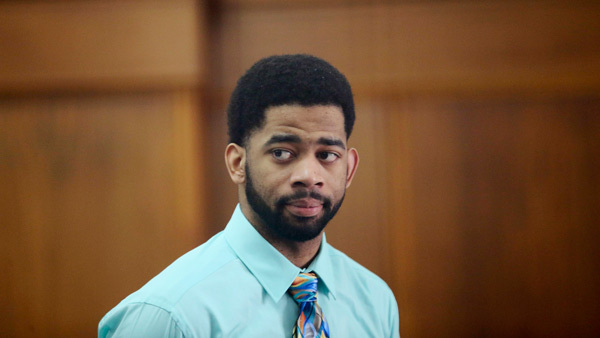 The Milwaukee acquittal also came as jurors in Ohio concluded their third day of deliberations in the murder retrial of a white University of Cincinnati police officer who fatally shot an unarmed black motorist. Ray Tensing's first trial ended last November in a hung jury after some 25 hours of deliberations on the murder and voluntary manslaughter charges. The Milwaukee verdict was in line with recent history. Data shows 82 officers nationwide have been charged with murder or manslaughter for on-duty fatal shootings since 2005, said Philip Stinson, a criminologist at Ohio's Bowling Green State University. Thirty-four of those cases, or 41 percent, have ended in non-convictions. Twenty-nine officers, or 34 percent, have been convicted, often for a lesser offense. The remaining cases are pending. Stinson said the race of the officer charged didn't appear to matter to judges or juries weighing these cases. Of the 12 black officers charged in the cases he tracked, three were convicted, five were acquitted, one had the case dismissed and three are pending. "I think that the police subculture trumps the race of the officer. Black officers act in the same ways as white officers do," Stinson said. "A police officer is a police officer." AP journalist Amy Forliti in Minneapolis contributed to this story.